I think I enjoy this day because it’s a day where I can let my creative nerdiness make an appearance and look cool doing it! I also enjoy it because it’s a way my son and I bond; light sabres, ships, figurines, Star Wars cakes, pastries and today meat pies. I’ve mentioned before that my whole family is a huge fan of Star Wars and super hero movies, much to the delight of my husband. I remember when we started our family, and third child in, they were all still girls, my husband was getting concerned as to who he could pass on his love of comic books, super heroes and sci fi to. That didn’t stop him from encouraging our little girls to play with super hero toys. My daughters’ favourite “dolls” we’re the plush action figures of Wonder Woman, Green Lantern. Superman, Batman, Aquaman and Martian Manhunter. They loved those things! We still have them because we did eventually have a little boy, and my husband found his successor. The girls are still big fans of Marvel and DC comic heroes and movies, and are the first to correct their friends who tend to mix up DC and Marvel heroes! Daddy beams with pride. I am glad that we do have a common interest as a family, even though it’s just superhero movies. Right now the kids are at that age of not wanting to do anything with their parents. We love to go hiking and visit the mountains but that is just not something they want to share with us. Thankfully, they are still willing to visit the museums and botanic gardens; I ended up getting memberships to encourage these visits. We’ll take what we can get. So, the fact that Star Wars and superhero movies are still cool enough to attend with your parents is quite a big deal for us! I have been writing about May the 4th for 4 years now, I think I’ve written all I can! But this year, we can talk about the new movie! Who would’ve thought after all these years, we would get a new Star Wars. Did any of you see it? We thoroughly enjoyed it. It’s nice to get some new blood into the franchise and I’m excited to see these characters grow. I think they made some nice actor/actress choices and the new film was entertaining and exciting. At the end of this year, we get another instalment but this one’s a prequel. I’m excited because Darth Vader will make an appearance in this one. We’ll have to dedicate May the 4th to him next year. I was racking my brain quite hard trying to think of something I hadn’t made yet for Star Wars Day. 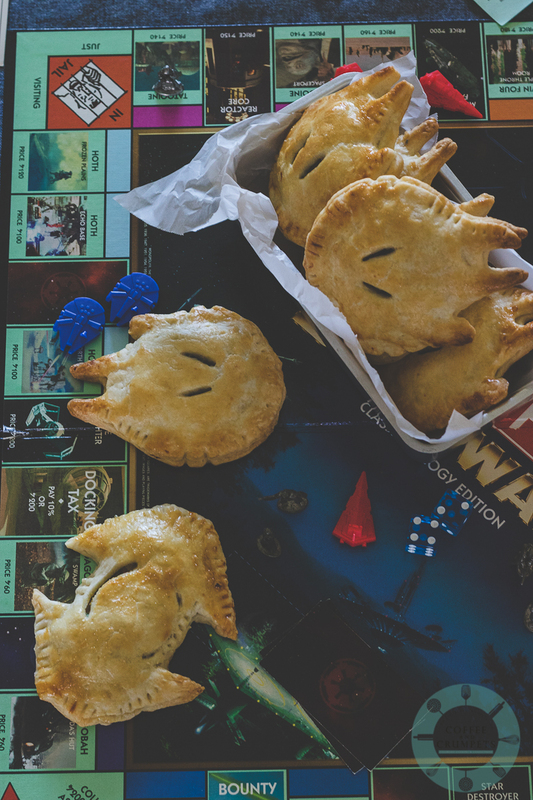 These are great because they can be made with a bunch of leftovers, whether you shape them like the Falcon, Tie Fighter or a regular old pasty, they are wonderfully tasty. A few years back, I was given a bunch of Star Wars cooking and baking stuff like cookie cutters, pancake moulds, and sandwich cutters. Over the 4 years, I have pretty much used all those for May the 4th. Check out my cookies, the tartlets and my star from last year, The Millennium Falcon cake. This year I used the sandwich cutters that come in two shapes, a Tie fighter and the Millennium Falcon. I cut out rich, butter pastry and stuffed it with a spicy, potato and chicken filling. These are fantastic. In the bowl of a food processor, add the flour and salt and pulse to mix. Run the processor and break up the butter to the size of peas. Add 3 tablespoons water and vinegar and process until dough starts to hold together. Check to see if the dough holds when pinched together. Add more water if it doesn't hold. Amount of water used does depend on the dryness if the flour and even the humidity in the air. Roll the dough into a disc, cover with plastic wrap and chill for at least 30 minutes. Place the cooked chicken, boiled, mashed potatoes, curry mix powder, garlic, ginger and the cilantro in a bowl and mix together. Keep aside until it's time to roll the pastry. Once dough is chilled, time to cut out the shapes. You can make paper templates or use the Star Wars sandwich cutters that I used. Or just cut out using a saucer or biscuit cutter to get small disc of pastry. If using the sandwich cutters, you will get enough 20-24 shapes after you re-roll the pastry a couple of times, to make 10-12 pies. Roll out the dough to about ⅛-¼ inch. I used the MF cutter and by pressing down on the cutter, I could cut out the shape of the MF pastry. The Tie Fighter is a bit smaller when you cut using the cutter. For the Tie Fighter, I used the cutter as a template and cut around it with a sharp knife. If you wont have these cutters, just cut out circles using a small plate, or draw your own Star Wars templates. Once all the cut outs are done, it's time to fill. Place about a teaspoon or two on pastry cut out. Place the top cut out over the filling. Press around gently but firmly to seal. Add a dab of water around the edges if you have trouble sealing. Use a fork to seal the tartlet. Repeat with the other cut outs. Place on a parchment lined baking sheet and place in the fridge to chill a few minutes. Allow to chill about 10-15 minutes. Place in the preheated oven for 30 minutes or until nice and golden brown on top. Allow to cool slightly on a rack. The filling makes a double batch. Either halve it to make 12 meat pies or make another batch of pastry dough and make extra. They will freeze nicely. Even though it’s May the 4th today, I won’t be able to have our usual Star Wars marathon. I have an event tonight and am busy cooking for a bunch of people. I’ll stop and have a break and enjoy a pie maybe. Have a wonderful week and if you will be enjoying Star Wars tonight, watch one for me! oi.. I can’t read the fine type. bold it a touch eh! I’m sure that your meat pies disappeared quickly. I know I would enjoy one. You always make spectacular treats to celebrate Star Wars Day. These Falcon Pies are not an exception! I still remember how much love and admiration I used to have for Wonder Woman, my fave superhero as a child. I was so happy to see her again in Batman versus Superman. I hope Marvel features her again in other movies. Sending you hugs. It’s so nice having you (and your recipes) back! These are so much fun and loved reading about the plush toys your girls played with. This is truly creative and I still remember from last year what you made. I watched the last one on a plane and wish I’d seen it on a big screen. I thought it was fun and restored my faith in the franchise after it lost it’s way. I’m a huge fan of pies in any shape or form – and chicken curry ones in particular. I’d love to have a bunch of these in the freezer for emergency snack attacks. Happy Star Wars Day! I hate to admit that after the first one I faded away, but my husband and son keep me updated on the newer ones. I love your meat pies. So creative! Thanks, Karen! I’m glad you have someone to keep you apprised of all that’s Star Wars! It’s important you know ? Are we doing lunch soon? I’ll message you. Good thing we’re family Kat otherwise I don’t know if we could be friends ?! Happy Star Wars Day! I was wondering whether you’d be doing something this year (loved everything you did in years past), and you didn’t disappoint. This is wonderful! Very creative. And tasty. 🙂 Thanks so much. You know me, John! Come hell or high water or total immobility on my part… I will remember Star Wars Day! Thanks for your lovely comment and May the 4th be with you ? Not a star war fan, but these meat pastries look just way too cute!